Itad, as part of the BRACED Knowledge Manager, is contributing to a growing evidence base on ‘What works and what does not to build resilience?’ to effect change across and beyond the BRACED focus countries. 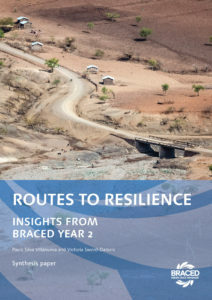 A new report, Routes to resilience: Insights from BRACED year 2, documents at the programme level how BRACED projects are contributing to building resilience to climate extremes and related disasters, and lessons we have learnt from this. The second year of implementation has provided more substantive and insightful evidence of changes across the programme, allowing us to deepen our understanding of the main enabling processes through which BRACED projects are building resilience. From the synthesis of evidence in year 2, we derive a set of seven key messages, which reflect our interpretation of what this evidence means for building resilience, accompanied by the implications for future practice. 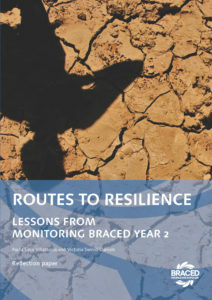 A companion paper Routes to resilience: lessons from monitoring BRACED, year 2 reflects on the monitoring and evaluation framework and the experiences of the BRACED Knowledge Manager in improving and applying this in its second year.